After an exhaustive search, I find affordable tickets to Israel on a Russian airline called Transaero, with one stopover for 13 hours in Moscow. I say to my wife, "Great, we have never seen the Kremlin, so here is our chance to do a little sightseeing on the way." Of course, knowing something about politics, I call the airline and ask whether a Visa is needed for a half day tour of Moscow, and I am assured that with an American Passport and only for a half day, a Visa is not needed. I book the flight. I email the itinerary to my daughter in Israel so she can arrange to pick us up. Since my old laptop computer is already unreliable, I spring for a new Acer laptop (from Walmart) for the trip, so there will be no problem with emails, blogging and connections to work back home. Spend hours setting up new laptop, loading all programs I need, and testing to make sure everything is working. Set Widget on laptop to monitor weather in Moscow and Tel Aviv. Hmm... It's 32F and snowing in Moscow, 67F and sunny in Tel Aviv. It's 32F and snowing in Moscow, 69F and sunny in Tel Aviv. It's 32F and still snowing in Moscow, 72F and sunny in Tel Aviv. Tickets ready, Passports ready, my bag packed, my wife's bag stuffed and an extra bag for presents and chocolates for the grandkids, we are ready. The "nephew car service" shows up an hour late, but we make it to Kennedy Airport in time. Checking in, only to find that the third bag costs an extra $50. Run to the Cashier to pay, run back to check-in to find I left passport at Cashier. Run to get passport, finish check-in, give in bags, (looks like we are the last ones, because they close the check-in counters as we leave) and we are rushed to the dreaded TSA Security Screening. I am ready! Shoes, belt, jacket and cellphone in plastic tray, laptop in another tray, carry-on and knapsack on the belt, and step through the metal detector. What a let-down. No groping, just a smile. (Did someone tell them that I was ready to do another TSA story?) Get to the gate - what do you know - there IS a Transaero Airline. We board and find our seats are a two seater on the wing. Great! Window for me, and an aisle for my wife. Cabin crew is nice, they ply us with food and drinks. The Glatt Kosher meal is quite good. I have a strong feeling that this is going to be a great trip. My seatback entertainment unit has a dime-sized black dot in the middle, but it doesn't matter because there is nothing on. No problem, I'll just listen to music. Find earphones in the seatpocket, but the plug is the wrong size for the unit. No problem, the cabin crew is offering portable DVD players - for $50? We'll pass. I'll just do my Sudoku. I doze off. We have been circling the airport for the past half hour. Captain just informs us we might have to land at different airport because "weather is better there." Half hour later we drop through the clouds right onto the runway of the correct airport. Snow abated to let us land, but can't see much out the window because of the fog. All the passengers are applauding. We disembark, are herded through the airport and steered to a "transfer" area because we are only passing through. To enter the Transfer Area, we have to go through the Russian version of the TSA. I know the drill. Shoes, belt, jacket and cellphone in plastic tray, laptop in another tray, carry-on and knapsack on the belt, and step through the metal detector. This time, stern looking Russian woman meets me on the other side, and I understand her Russian comments perfectly. Assume position for a pat-down. (I know what she said, cause I just witnessed her patting down my wife in front of me.) An efficient pat-down, but no groping. We are now in the Transfer Area. I ask about visiting Moscow, and I'm told we need Visa. In spite of what I was told earlier, "need Visa" at a cost of $150 each. OK, not that desperate to see Moscow, and there is an 11AM flight out to Tel Aviv. Can we switch to the 11AM plane? Yes, but it will cost 100 Euros ($140). OK, how do I change the tickets? Well, you have to go downstairs to the ticket office, but it is outside Transfer Area, so you need Visa to go there. Slowly we resolve ourselves to a 12 hour wait in the Transfer Area. Find 2 rows of seats near the Chanel Cosmetics counter, settle down for the duration. Check for Wifi, and to my surprise there is FREE Wifi available. GREAT! Got new computer, so I can get some blogging done. Turn on new computer, it goes through the startup, but screen is still black. Nothing I try changes the black screen. OK, no blogging, but I can still use my Droid phone to check email. 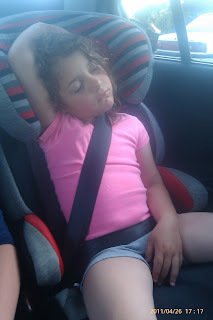 Got email from daughter wanting to know why I didn't send Itinerary (which I thought I did). I reply with the itinerary and ask if someone can pick us up. Luckily there is a Liquor counter nearby giving out free samples of Johnny Walker Double Black. I make a few trips. For a while, the seats in front of us are filled with some Russian girls, who pass the wait time by swigging from a bottle of Baily's and a bottle of Vodka. Interesting local customs. I do NOT reach for the bottles. Side note: While I am looking for a restroom, I follow the signs and find myself in a cleaning crew closet, but they gently guide me back to the hallway containing the restrooms. One young lady makes sure I enter the “Men's” Room. Since the Boarding Pass for the second leg of the journey has my wife and I sitting apart, I want to be first at the boarding gate, to be able to rectify this. 45 minutes to departure, gate is opened and I'm told that they can't change seats. My reaction - "Bolshoi, they just changed seats for someone else". We board, and my wife convinces a guy in her row to switch with me. We now only have a young lady sitting between us. I realize I never got response from my daughter about being picked up. No problem. We can rent a car or take a cab. Uneventful flight to Tel Aviv, and I sleep all the way except for the meals. All the luggage arrives safely, and as we exit through customs, we are greeted by 3 grinning grandchildren and a very tired daughter. After sleeping in late, we get reacquainted with our long-distance grandkids while we get ready for the Sabbath. Call my mother to tell her we are here, and we’ll see her when she joins us for Passover Seder meal. (No, I can’t come over – no car.) We usher in the Sabbath with candle lighting and Synagogue services. A relaxing Sabbath before the frantic last minute Passover preparations. I have a feeling that before I leave here I will be in great shape, because to get to the Synagogue I have to climb up 124 steps. And I’ll be doing it twice daily. Great! Preparations kick into high gear with cooking for the expected crowd. I stay out of the way and supervise. Play with the 4 year old future beauty queen who is now my best friend. Walk with my little granddaughter UP to the park for a little one-on-one bonding. The extended family arrives and we are ready for Passover. 124 steps up, then down, and we are ready for the Seder meal. Matzo, wine, bitter herbs, reciting the Haggadah and a many course meal. Traditions are great! Happy Passover celebration with the extended family. The steps are starting to get easier. This is GREAT! The intemediate Holiday days are meant to be spent with the kids, and we do. 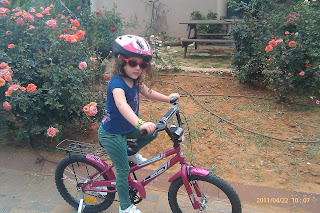 Buy first bike for the little one, and then spend hours running behind her as she learns quickly. Catch a spirited 18 holes of Mini-Golf, and find that I will not be challenging President Obama any time soon. But I am happy to say the I still had the highest score. ( What do you mean that lower is better?) Stupid game! Getting ready for the last day of Passover. Call first dibs on the shower. Realize I don't have my towel, walk down 6 stone-tiled steps to get towel. My sock clad foot slips off the bottom step, I fight to retain balance, but end up on floor writhing in pain. I recover my breath, but I KNOW what just happened. I tore a calf muscle. Eventually I manage to hobble back to the shower and try to soothe the pain in my calf. Time to walk to the Synagogue, and I leave early to hobble UP the 124 steps and back down after the services. Time for the morning services, and the 124 steps will not deter me. I have a high tolerance for pain, and I will not let it keep me from spending quality time with the kids. Sure, I'll take you to the park. 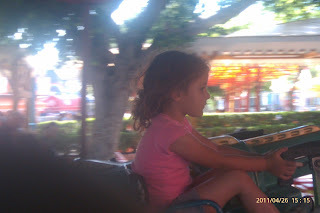 With the Passover Holiday behind us and since the children have one more day before returning to school, we decide to take the 3 youngest grandkids to Luna Park, an amusement park in Tel Aviv. Great idea - some more serious bonding with the kids. We have the rental car, travel directions printed, food and water packed, sunscreen applied, and we're on the way. Directions are clear (as clear as something translated by an Israeli native from Hebrew to English can be), and we're making great time. Half hour later, I think we are lost. We're on a highway again, and all signs are pointing to Haifa. 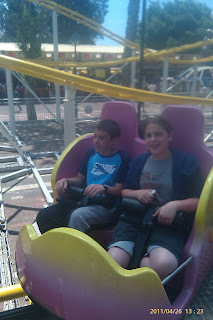 No problem, I have a backup itinerary to a Science museum in Haifa, but the kids insist on Luna Park. We turn around, stop at a gas station and ask for directions. Go back the way we came, then left at the fourth light. Hey, that's great. We were only 2 blocks from the park about 25 minutes ago. Park the car in a lot, and walk to the park entrance. Hmmm... WALK! With my injured foot, all I can manage is a slow hobble. No problem, I'll work up to a fast hobble, let's go. Hate ticket lines. 4 "adults" and a 4 year old for 490 Shekels (that's US$ 144 today). Wow, this better be great! Lots of rides for the little one, and lots of rides for the "adults". We split up, wife with little one; I get the 12 & 13 year old "adults". Hey, wait up for me. Two hours later, girl "adult" joins wife, boy "adult" and I go for the "coolest" rides. Wait! What do you mean I have to go on the rides? OK, no problem for macho gramps. All right, that last one (Pirate Ship) did something funny to my stomach. Good thing I haven't eaten much, but how do you say "Men's Room" in Hebrew? 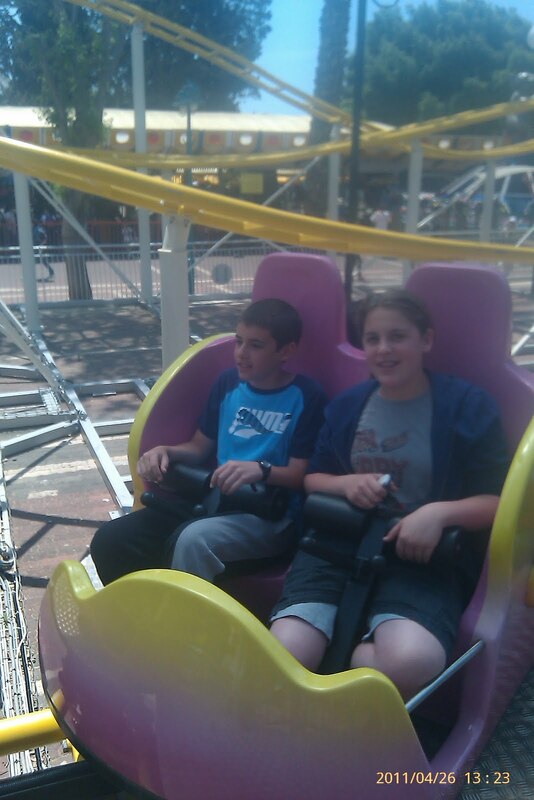 OK, no more rides for me! I'll just rest my foot here on this bench, and you all be back here by 4PM. I now know why they call this place Luna (as in Lunatics) Park. That was "fun". Find car, pay ransom to exit lot, and head for home with a child and 2 "adults" asleep in the back. Since I still can only hobble around, I deem this a day of rest. Kids go back to school, wife is antsy so she goes shopping with youngest grandson when he returns from school, but I kick back on the recliner and (finally) put my swelling foot up. Today is a chill-out day. My foot is not only swollen, but it looks like I have also developed what looks to me to be cellulitis. Since travel day is just a few days away, I consult with my daughter, (who up until a few months ago, was an Emergency Room nurse at one of the busiest hospitals in Israel) and she thinks I should see a doctor. I get a second opinion from my daughter in Seattle, who is a physician. Opinion - go to the Emergency Room. O.K., I will; tomorrow. Call long distance to my check my Health Insurance, and I am assured that I am covered, but there is a $500 deductible and then 70% coverage. All right, could be worse. My daughter drags me to the ER, then pretends that she still works there, and starts pulling strings. I register, and they swipe my Visa card. Great, I hope this won't cost too much. I am ready. Blood test - my mind thinks "$Kaching$!" Sonogram to check for clots - "$Kaching$!". X-Ray to check for breaks - "$Kaching$!". Orthopedic Consult - "$Kaching$!" Diagnosis - Torn calf muscle and cellulitis. (Wow! Isn't that what I said? I should become a doctor!) I get discharged in under 3 hours - is that an ER record? Get my final bill and it is 995 Shekels. Quick conversion to Dollars gives me $289. Wow! I better get out of here before they realize their mistake. Get back home and sack out on the couch before I take a shower for the Sabbath. The TV is on and showing BBC. OH NO! Egypt, Tunisia and Lybia brought down by demonstrators, and now I am watching England with a humongous demonstration. Tremendous crowds, but seems pretty peaceful. I guess that's how the British demonstrate. What do you mean? What wedding? Is that today? Whew... so they are NOT being marched to the .... In that case, Congratulations and long live William and Kate, the future King and Queen of England. So this is the last full day to spend with my mother, my daughter and her family. I do my final hobble up and down the 124 steps, but my hoped for exercise gains have not materialized. No problem, I'll just have to do it the hard way when I get home. In the evening we bid the Sabbath good bye for another week, and we say our good byes to my mother and the children as well. By the time we arise in the morning the kids will be on the way to school, and by the time they come home we will be flying home. So long everyone until next time. I sit down at the computer to check email and blog activity, when it hits me that the trip back also includes a 13 hour layover in Moscow, or as we by now know, in a little corner of the Moscow airport. I frantically try to find a connecting flight out of Russia that gives us a reprieve, but none can be found. I finally find a flight that leaves Israel after midnight, and gets to Moscow with less than 4 hours to wait until the connecting flight. I talk to a Transaero agent who cancels my old reservation, makes the new reservation, but tells me that I will get the ticket only upon payment of the change fee. No problem, where do I do this. "Oh, you can go to Tel Aviv," (no way I'm doing that!) "or you can go to the airport ticket office." Great, the airport it is. Wow, did this really take so long? It is now past 1:30AM, and I better get some sleep. I wake up in time to kiss the kids good bye one more time before they hop on their school buses. When my wife wakes, I excitedly tell her about the new itinerary. Here is my plan. We'll go to the airport early and take care of the ticketing, check in our bags early, then we have the whole day to still play tourist. Off to the airport, park the car, drag the bags to the ticket counter and present the reservation number. "We are still working with the earlier flight, come back 3 hours before the flight." But I am here now! "No ticket and no check-in until 3 hours to flight!" So you get what you pay for. No problem, we'll just take the bags with us. We visit my father's grave, spend a few more hours with my mother (who was really confused when we showed up), bought my requisite "lafa" (this is a really big Pita filled with Shwarma meat or falafel, french fries and the kitchen sink), and eventually head back to the airport. Ticket office is closed. So they were really serious about the 3 hours. No problem, we'll just chill out here for a few hours. Ticket in hand, we head for the check-in. After a short wait in a line, we come to the luggage X-Ray station where all check-in luggage is screened and checked for explosives. For some reason, we are waved through without checking. (Hmmm... they must have found out that I am a world famous blogger.) As we wait at the check-in desk, I seek out the Supervisor to complain about the troglodyte at the ticketing desk. She seems to know who I am talking about, and emails the complaint up the chain and offers us an upgrade for our troubles. Great! I'm glad I spoke up. Flight boards on time, the seats are great, though the Kosher meal request did not survive the reservation change. No problem, they have extras, so we don't starve. My foot is complaining about being abused. Upon landing in Moscow, the plane does not pull up to the terminal chute, but instead stops away from the terminal. We are bussed directly to the "Transfer Area". (I thought that I detected heavy security surrounding the plane) We go through the security screening again, but no frisking this time. We return to our waiting area from the last stop here, but alas the Liquor Store is not sharing any samples this time. I take time for my morning prayers, then eventually we head for the next boarding gate. Security seems to be higher this time than when we were heading to Israel. We board and get great seats again. I keep popping the antibiotics, but my leg is not getting any better. Smooth flight, Kosher meals fine but still half frozen, however I still have stuff that we appropriated from my daughter's leftovers. We land at Kennedy airport five minutes early. "I don't need a wheelchair, but why are you walking so fast? Wait up for me!" As we wait in line for Passport Control, I watch an overhead TV screen tuned to the news. Why are they talking about Osama Bin Laden in the past tense? I ask the Passport Control agent the question and he fills us in on the Osama news. Although there was no indication of this news in Russia, this would explain the additional security "for the Americans" that I detected at the airport. We find our luggage, and the "Nephew Car Service" is on time. We are glad to be home. Because my right leg was twice the size of the left one when we got home, my wife convinced me to go to my favorite Emergency Room. Same tests, same diagnosis, but they gave me IV antibiotics and switched me from Augmentin to Clindamycin with orders to stay off my feet and keep the foot elevated for 10 days. I managed 3 days, but by now I am walking almost humanlike. I asked my wife to return my broken NEW Acer laptop to Walmart for a replacement, but she was told the return policy on laptops is only 2 weeks. The retort that it only worked for 2 days and we were out of the country for 3 weeks did not sway them, and our only recourse was to ship it back to Acer for repair. Presently the computer is theoretically on the way back to me from Acer. Hope it will work this time. Ah the joys of international travel! So far, sounds entertaining and interesting (if a bit frustrating at points). Thanks for your warm sentiments, Prosey. Will try to keep things updated. Sssshhh...can't have people knowing I'm a big (Progressive) softie. ;p Especially not Lori, who probably really believes I'm a heartless, baby-eating baddie...*giggle*...okay, I'll stop. Gosh, I'd need to week to relax from all that! ...what we endure for family. What a wonderfully unpleasant story! I loved it...and the word troglodyte. I loved your wonderfully unpleasant story...and my new word, troglodyte! I loved the present-tense narration, sardonic humor, stoicism toward all things surly, indifferent, and unfavorable. I saw your story as if I were reading a book. Sorry to bust in but I saw your tweet suggestion to another tweeter. That makes me a cyber-stalker? So sorry for that : / But knew I'd like you when I saw you; had me at the word "logic."